Welcome to my cookbook. These recipes are simple and can be made from basic ingredients. They can be stocked in my kitchen, and not leave me running to the store very often! Pure homemade goodness is accomplished using "real" foods... butter, whole milk, and fresh stone ground flour from Bob's Red Mill. I have a Bosch mixer, which has a large capacity and is very heavy duty. 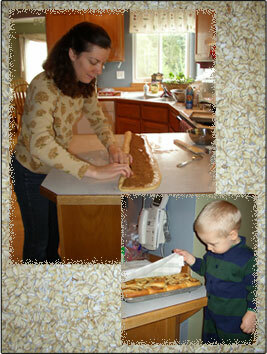 It can mix enough bread dough to make four 32oz loaves, without kneading by hand at all! I also have large cooking and baking pans. My bread pans were used commercial pans. I hope you enjoy some scrumptious home cooking! My kids gave me a cookbook that I love so much that I don't always type in my recipes anymore. The recipes are reliable and good right from the book. You can purchase this cookbook at Exodus Books.